NYCDailyDeals -- What's Free And Cheap In New York City Today: Fulton Street Market Is Open! 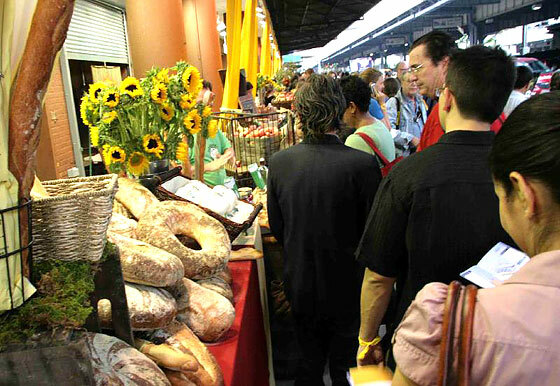 The Fulton Street Market opened last weekend at the South Street Seaport. It's open on Friday and Saturdays from 10AM - 6PM throughout the summer. You can click here for a full lineup of vendors, but below are some that look good to us (courtesy of Grub Street)! Cupcake Express, New York, N.Y. - Named #1 cupcake by the New York Post, they bake and ice their cupcakes fresh each day, with 100% pure butter and 100% pure love. Breezy Hill Orchard/Knoll Krest Farm, Staatsburg, NY - A New York farmer's market favorite known for their pears, apples, cider, eggs, fresh pasta and baked goods. New York Winestand - Made possible by the New York Wine & Grape Foundation, they feature a rotating selection of winegrowers from Long Island, the Finger Lakes, the Hudson River Valley as well as other regions. In addition, there are plans to host several chef demonstrations pairing local foods with wine.